Competition air pump idler bracket for off-road use only, where air pump is not necessary. 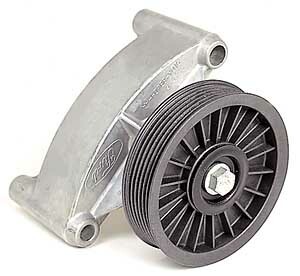 This idler is a direct bolt-on replacement for stock air pumps and uses a standard serpentine belt. Fits 302/351 Mustang applications when catalytic converters are not used. Uses stock belt. Does Ford Performance M-8604-A50 fit your vehicle? M-8604-A50 is rated 5.0 out of 5 by 2. Rated 5 out of 5 by Tangelfoot from Perfect fit Bought for a 88 thunder bird 5.0 perfect fit, only had to buy one size smaller belt since smog pump pulley was larger. Great Ford part made in USA. Rated 5 out of 5 by wyobuckaroo from Everything worked good, fast shipping and the bracket bolted up in the factory spot with out any issues.